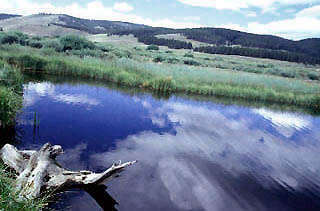 Description: The Hurd Creek Ranch offers four good miles of fishing on Ranch Creek, and two trophy ponds with large, cultivated rainbows. Ranch Creek is fed by 3 smaller streams that join on the property and at 40 feet across, it has good volume with riffles, runs, and cutbanks. Accommodations include log cabins and a lodge with all the amenities. Location: The ranch is located east of Hwy. 40 between Tabernash and Fraser, approximately 1 1/2 hours from Denver.